Alison Moyet – But Is It Any Good? OTHER SONGS YOU MAY KNOW: If you were in the UK, yeah. Here, maybe not. WHAT’S IT ALL ABOUT: Compilation of the first phase of Moyet’s solo career, where she seemed beholden to the record company to make commercial records. SOME WORDS, PHRASES AND CLAUSES ABOUT THIS RECORD: Having reviewed the first solo record from Alison Moyet, I thought it may be best to skip ahead and wrap up her initial phase with a hits collection – since she was rather much forced to be more commercial and less artistic. Most everything seems ready-made for the radio in the late 80’s and early 90’s. Moyet’s voice is as big and powerful as usual, but the material does seem overly commercial. Some of the lesser songs, especially in the early 90’s, showcase her more dusky, melancholy sound. The interesting thing (or infuriating, if you’re her) is that her two 1990’s albums didn’t fare too well, and even a great song like “Getting Into Something” stiffed, relatively. So, yeah on that commercial mandate. After 1995, she took a lot of time off, waiting for her contract to expire. When it did, she decided she was going to make records that suited her, not the suits. NOTES & MINUTIAE: The first three songs here are songs that she sang on for Yazoo, while six of them are non-album singles. So almost half of this is from non-album material. GRADE: B: When she cuts loose on songs that aren’t just commercial fodder, it’s shows she’s got talent. 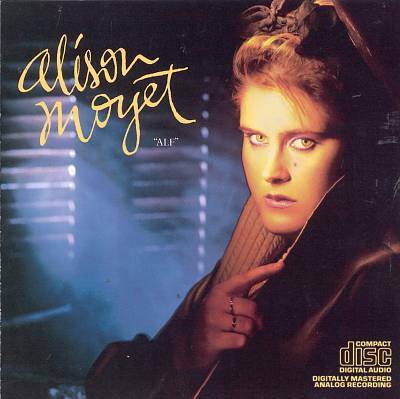 WHAT’S IT ALL ABOUT: The first solo album by Moyet after leaving Yaz kinda, sorta reminds one of Yaz anyway. SOME WORDS, PHRASES AND CLAUSES ABOUT THIS RECORD: Moyet has a great and atypical voice – dark and bluesy and low. She was a great fit for Vince Clarke in Yaz (or Yazoo if you prefer the UK nom de plume), and it makes sense that her first solo record would follow in the same new wave-ish vein, but instead of all electronica, it’s mostly synth-pop lite. What’s the issue is that while the songs are nice and pleasant and she sings the heck out of them there’s nothing that grabs you like the best Yaz songs did. The non-single tracks are just kinda there, which is not what I was looking for in this album. The production doesn’t do the songs much favors, either. NOTES & MINUTIAE: The producers of the record (Jolley and Swain) were also Bananarama’s producers, so there’s that..
GRADE: B- : It’s good, but I’m not keeping the whole thing, just the singles and maybe a track or so. EXILED – Most of it, anyway.